No-one’s too cool for California Superbike School with even an “overconfident motorcycle journalist” like Paul Browne benefiting from a little track teaching. A man, of fantastic hair, Keith Code, founded the California Superbike School in the Eighties. The teachings used in the school were all born of structure and theory explained in his Twist of the Wrist books. After writing them he then went on to formulate a programme to teach people these principles in the practical setting of a race track. Having done a number of days with the school over the last few years I had now reached the lofty heights of level four. Everyone starts at level one no matter how experienced he or she is or where he or she rides, be it on road or track. The school is structured to help us all become better riders wherever we ride and following the structure is the only way it would work for me. Having first done level one a number of years ago I was very impressed, not just with that structured approach, but how a somewhat jaded, overconfident motorcycle journalist could improve so dramatically from one day’s training. I have, as some might say, been converted, and now I try to get back on track with the team whenever I can. Level four allows me to work on specific areas of my motorcycling, nip some of my appalling habits in the bud and practice good riding. There is a theory that riding what ever it is that you usually ride on track is the best thing to do and riding the trusted R1200GS around Mondello would, indeed, be fine. Today, however, is too sunny and just too damn special to be making do. Whilst I have ridden the ‘small’ Panigale before, the opportunity to ride one on track is way too good an offer to turn down. There is something very special about thumbing the starter on a Ducati sportsbike. Even with the standard cans the noise is full of promise while the bike is still at idle! 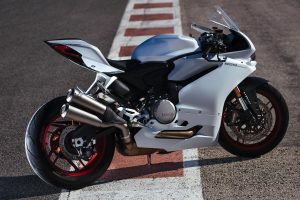 The machine is incredibly well specced and the white body work with red wheels combo is easy on the eye. The 955cc twin is, perhaps, a little less intimidating than the new V4 and as such I’m looking forward to using the bike in its natural habitat, the racetrack. The bike comes as standard with Bosch ABS. This is served through a pair of Brembo monobloc radially mounted calipers on the front end and a single disc down the back. 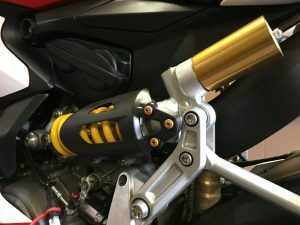 The clutch is a slipper affair, this should help hide some of my poor down-shifting, and the suspension and fuel are all electronically adjustable from the toggle on the handlebars. The bike puts out a more than usable 150 bhp, but more importantly there is 102 nm of torque to play with. On the initial outings my incredibly patient coach reminds me that we’ll be riding in one gear only and won’t be using any brakes. 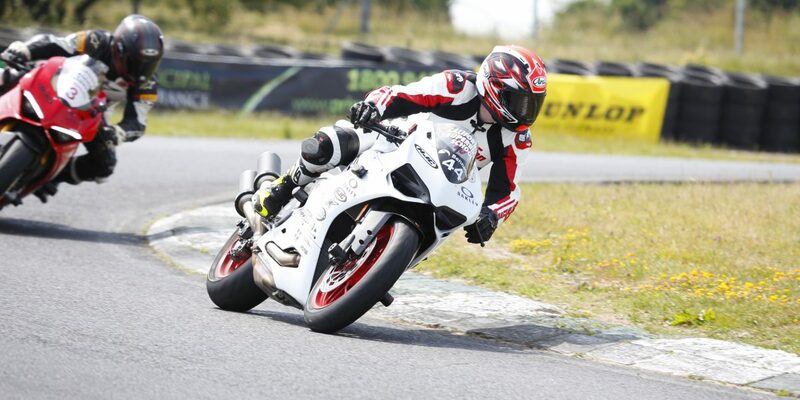 This proves to be an excellent way to get used to the track and get settled on the bike in a quicker than usual time. The standard bike sits on Showa big piston forks which are fully adjustable and the back end is a worked by a fully adjustable Sachs shock. Sitting the thing on a set of super sticky Pirelli Super Corsa’s just puts the icing on this sweetest of cakes. The California Superbike School is just that, a school, and isn’t a track day. To that end there must be at least six foot between riders when they are passing each other on the track. There is also no racing. The same set of flags are used as at any track day or race event and the sessions are well managed with quality feedback from the coach after each. Drills from the previous levels come flooding back with the quick turn and using reference points resulting in getting corner after corner buttoned down. As my confidence goes up so does my speed. At the end of the day we’re riding with all gears and full brakes. The weather is perfect, the Ducati is fantastic and I am, once again a much better motorcyclist than I was a few hours previously. The great news for me, and you of course but mostly, me is that the team from the school is already making plans to return next year. Rumour has it that one of them has even applied for citizenship! The California Superbike School host a full calendar of schools each year where they also rent a fleet of new Ducati motorcyles. Click here for details of available dates. Remember, there’s always room for improvement no matter how good or fast a rider you are. In addition, the good people at Rosso Ducati (01464 2211) have a Panigale 959 available to test ride.